Proposed legislation would help stabilize electricity prices, while better protecting Albertans from incorrect power bills. 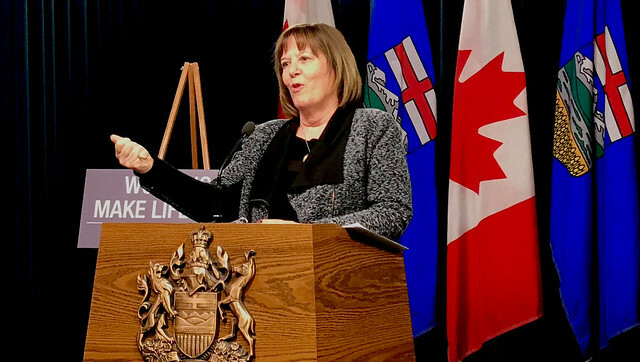 Energy Minister Margaret McCuaig-Boyd announces legislation to further modernize and strengthen Alberta’s electricity system with a focus on increasing consumer protection. If passed, An Act to Secure Alberta’s Electricity Future would better protect consumers by empowering the Alberta Utilities Commission (AUC) to penalize electricity and natural gas service providers for breaches of customer service, such as sending out late bills or overcharging consumers. Currently in Alberta, the only tool available to hold companies to account is a formal hearing process, which can be lengthy and costly. This legislation would allow the AUC to issue penalties, similar to a traffic ticket, to ensure all service providers are following the rules. The AUC would develop the penalties in consultation with stakeholders and service providers to ensure they are fair. Increase investor confidence by providing policy and regulatory certainty by clarifying how infrastructure losses and profits are split between consumers and utility companies. Provide more options to Albertans who want to generate their own electricity from renewable or alternative sources. Enable the creation of a capacity market. Creating a capacity market for electricity would protect consumers from price volatility and provide a reliable supply of power at stable, affordable prices. Currently, Alberta is one of only two jurisdictions in North America using an energy-only market. In this system, generators are paid for the electricity they produce based solely on the wholesale price of electricity, which fluctuates. Moving to a capacity market allows for competition, innovation and private investment and was recommended by current and potential energy investors, external experts, consumer groups and the Alberta Electric System Operator (AESO), which oversees the province’s electricity in the interest of the public. Plans to modernize Alberta’s electricity system were first announced in November 2016. Since then, the government has worked with stakeholders to develop policies that balance the interests of both industry and consumers. This legislation builds off other consumer-focused initiatives, including a proposal to create a one-stop shop for Albertans to resolve all disputes with their utility bills, and protecting consumers from misleading, high-pressure sales tactics by banning unsolicited door-to-door sales of energy products.